II cl. 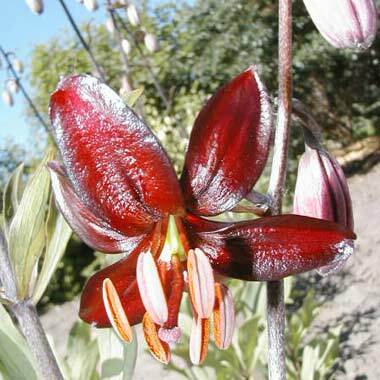 (Un-named L. martagon hybrid x 'Hantsing') H:1972, G: c1976, N:1988 & Reg:1988: F.Tarlton I: Honeywood Lilies. Deep red (53A), tips almost black; exterior of outer 3 petals strong purplish red (63A), exterior of inner 3 petals 53A with a stripe of 63A; unspotted; nectaries 63A; pollen strong orange (26A). Petals 37 x 15mm, not ruffled, strongly recurved. Lvs whorled, 95 x 30mm, mid green. Stems 1.2m, dark green, with 16 or more fls. June.